Healing S.E.N.S.E. : About Dr. Olson and Healing S.E.N.S.E. Dr. Olson has been practicing Chiropractic medicine and acupuncture for more than 26 years, with well over 75,000 treatments given using Traditional Chinese Medicine. He studied for twelve years with Master Guo, a sixth-generation Traditional Chinese Herbal practitioner, and has been using Chinese herbs in his practice for over 20 years. We have five major senses that allow us to interact with parts of our environment: sight, hearing, taste, smell, and touch. In health and healing there are also five senses: spiritual, emotional, nutritional, structural and energetic. Collectively, they are called Healing S.E.N.S.E. Establishing an integrated balance between these five senses promotes excellent health and extinguishes disease. Of the five healing senses, spirit is the most subtle and refined. Spirituality is that fine golden cord that maintains our delicate connection to the divine. It is the hardest to quantify and the most difficult to live without. Inner peace and confidence is the by-product of a radiant connection to the spiritual. Even though it is remarkably elastic, it provides a person with a foundation whose roots extend beyond time into eternity. It is the anchor that gives stability to all the other senses. These are the outcropping of our experiences as seen through the filter of our spiritual foundation. Any experience can be seen as an opportunity for improvement and growth if our spiritual anchor is firmly set. Proper emotional guidance can bring focus to a life lacking vision and purpose. This is the process of transferring the light of the sun to our bodies. Good nutrition is balanced with the rhythm of earth's cycles, moderation and social health. Every food has nutritional as well as energetic qualities: proper nutrition balances the two in a simple harmony that gives life and balance in every sense. This not only effects every system of the body, but also reflects the integrity of all the other systems. The nerve system has direct control and input to every system, form and function in the body. And if our structure has integrity, the nerve system will be free to function with incredible efficiency. Chiropractic adjustments remove spinal subluxations, allowing the free expression of neurological discrimination and direction, and resulting in greater health. Everything is energy. Next to spirit, it is the most subtle and pervasive quality of health. But unlike spirit, energy can be manipulated to encourage greater health. Energy manipulation can be accomplished through Acupuncture, Meditation, Qigong, Tai Chi, Healing Touch, Reiki, massage and Tragar. Traditional Chinese Herbal Medicine is able to deeply affect the flow and balance of energy in the body. Good energy quality, quantity, and flow in the body create maximum potential health. Dr. Olson blends these five aspects of health into a comprehensive healing plan, helping people achieve balance and optimal health through all-natural means. The most complete healing happens when patients are willing to improve in every S.E.N.S.E. of health. Everyone, whether child or adult, can benefit from learning how to heal. 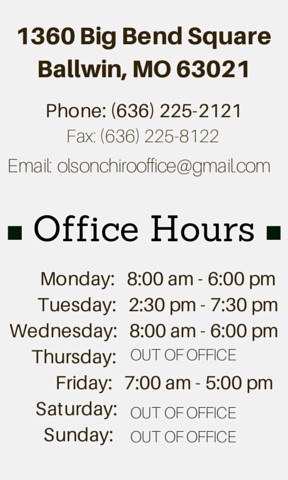 At Olson Chiropractic, you will find the foundation for this process to begin, and Dr. Olson will help you in each step along the path to your optimal wellness.